This chapter focuses on the basics of the blockchain technology and the financial infrastructure that has developed in this space over the past eight years. Keywords such as blockchain, cryptocurrency, Bitcoin, cryptocurrency exchange, altcoin, and initial coin offering are defined. The terms blockchain, cryptocurrency, and Bitcoin are becoming increasingly relevant for finance. In 2008, a research proposal was released on an online forum called “Bitcoin: A Peer-to-Peer Electronic Cash System” by a mysterious programmer(s) going by the pseudonym Satoshi Nakamoto. Although the basic idea of a blockchain data structure had existed for several decades, this was the first time that blockchain technology had been combined with peer-to-peer (P2P) networking, cryptography, and distributed computing. In 2009, the developer of Bitcoin released the first version of the Bitcoin software protocol. During the first few months, programmers from around the world worked on improving the software code. By the end of 2009, the Bitcoin software was robust, open-source, and free. Anyone could download the software and begin sending transactions to other people. The foundation for the blockchain technology was laid when the first Internet was created in California in 1969. Today’s widespread adoption of the Internet enables billions of users to engage in P2P networks that share files and information. In a similar way to the Internet, Bitcoin’s P2P software is comprised of “nodes” that broadcast information about transactions to other nodes on the network. However, simply having a P2P network would not be sufficient for building decentralized digital money. The next part of the puzzle came when cryptographers discovered asymmetric encryption in the 1970s. Asymmetric encryption fundamentally changed the way people can share private information. Today, governments, banks, insurance companies, and many other firms use encryption tools for applications such as storing sensitive customer data and enabling secure online payments. Fast-forward a decade and the last piece of the puzzle was developed: blockchain. Up until this point, changes to digital data could not be chronologically ordered without relying on external timestamps. Although a seemingly small inconvenience, the inability to timestamp data made it possible for counterparties to change, add, and delete digital files without leaving footprints. The blockchain data structure enabled internal timestamping for the first time. From this point forward, governments and companies could digitally track every single change made to each data file. Following these information technology discoveries, the first attempts at digital cash were made. American inventor David Chaum designed DigiCash, an electronic cash system that was based on cryptographic algorithms in 1983. In 1997, Adam Back, a British cryptographer created HashCash that used encryption tools to block email spam. In 1998, Wei Dai and Nick Szabo released b-money as well as bit gold, respectively. All failed to gain significant adoption. Then in 2008, the creator(s) of Bitcoin combined P2P networking, asymmetric cryptography, and the blockchain data structure to create a transparent and secure global monetary system. Cryptocurrencies and the blockchain allow users to generate units of currency and transfer funds without intermediaries. The rigor of the underlying technologies provides evidence that this is not a scam or ponzi scheme. However, the adoption of this technology depends on several factors independent of the technology itself. Government regulation and consumer preferences will play key roles in the success of the blockchain. For example, government regulation has the power to either crush or support this nascent technology. In addition to government regulation, consumer preferences are a crucial determinant of the use of blockchain-based money. If consumers prefer “sound” or commodity monies such as gold or government monies such as the euro, then the blockchain technology may not become the global decentralized money that Nakamoto had envisioned. On the other hand, not everyone has to agree on using the same currency. Instead of completely replacing the commodity and fiat monies, cryptocurrency may become a third option with unique advantages and risks. The remainder of this chapter provides an in-depth review of the blockchain technology, cryptocurrencies, and the financial infrastructure that has developed over the past eight years. The first section on the blockchain technology lays a foundation for the economic and technical features of this data structure. The second section explains how the technologies cryptocurrency and blockchain are inherently inseparable. The third section describes the top five cryptocurrency coins in detail. The penultimate section sheds light on the terms initial coin offering and token generating event. This chapter is concluded with an overview of the financial intermediaries including exchanges and brokerages that facilitate trading markets and provide liquidity for the cryptocurrency ecosystem. The blockchain technology refers to a collection of digital methods for storing identical data in multiple locations. The blockchain technology, also called the distributed ledger technology (DLT), was popularized in a white paper released in 2008 by a covert author under the name of Satoshi Nakamoto. 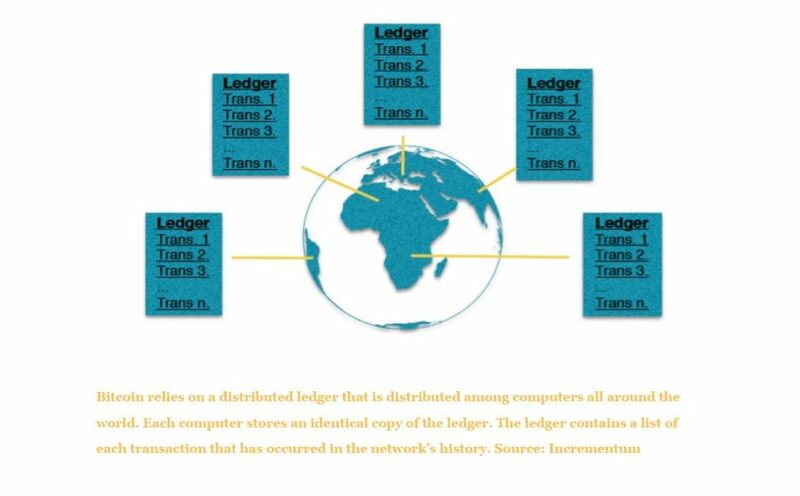 A blockchain can be thought of as a database that stores the amount of accounting units held by each user. Users can receive and spend their account units, referred to as cryptocurrencies, with an encrypted password, referred to as a public-private key pair. Since 2008, over 1000 different blockchains and corresponding cryptocurrencies have been created. A blockchain is a collection of information that is not held by one entity but rather distributed across all computers in the network known as nodes. Due to the redundancy of data storage, blockchains are enormously expensive to operate and they are slow. Each computer around the world that stores a copy of the database must agree to each change made to the database before the network can process new data entries. Despite the setbacks, blockchains harness unparalleled computing power and security, which provide users with services that cannot be provided by any other technology. The Bitcoin blockchain is an example of a peer network node data storage system that continuously grows as transactions are broadcasted and verified by the network. Storing identical data in multiple locations provides security benefits and latency drawbacks compared to storing data in one location. In information science, the former method is referred to as distributed computing while the latter is referred to as single point of failure (SPOF) storage. A centralized database that has a SPOF can be easily hacked and sensitive data can be compromised, changed, deleted, or altered. In contrast, data stored in computers located in different geographic regions throughout the world makes an adversary’s job exponentially more difficult. Distributed computing commonly uses two fictional characters, Alice and Bob, to illustrate concrete use cases of the technology. To understand how a basic blockchain transaction works, imagine that Alice is a customer at a coffee shop and Bob is the owner of the coffee shop who is selling Alice a nice cup of coffee. Instead of using cash, Alice wants to send one digital coin to Bob in exchange for the physical coffee that she ordered in Bob’s coffee shop. If Bob happens to have the digital coin software, also referred to as a “cryptocurrency wallet,” on his phone, Bob can easily open the software on his phone and accept a payment from Alice by scanning the QR code shown on Alice’s software on her phone. Alice will instantly see her account debited by the amount that she specified, and Bob will see his account credited with the same amount. For Alice and Bob, their work is done. Bob’s phone will get a beep sound that signifies to him that Alice’s transaction has been broadcast to the P2P network of computers around the world that are actively listening for new transactions. 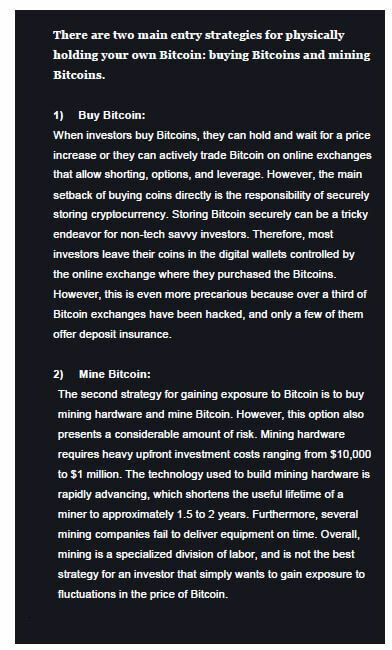 The individuals or groups of individuals that operate the computers that listen to transactions are often referred to as miners. Using special hardware, miners create blocks containing a list of transactions that have been broadcasted to the network by users. Next, blocks are added one after the other in a chronological order, creating a chain, hence, the name, blockchain. Once the miners hear Alice’s transaction Bob’s wallet, they will add this transaction to a list of transactions stored in a “candidate” block. A candidate block is a block that has not been confirmed in the blockchain. Before confirming the candidate block and the transactions inside of it, the miners compute hashes until they find a desirable number that is less than a specific number set by the software protocol. In the Bitcoin protocol for example, miners must find the right “nonce”, or arbitrary number, that produces a hash lower than the difficulty target set by the software. The hash that is lower than the difficulty target becomes that specific block’s identification number. The first miner to find a hash that is lower than the given difficulty target will receive a reward and the transaction fee that Alice paid to the network when she broadcasted her payment. After approximately ten minutes, the transaction will be confirmed by all of the computers in the network, and there will be no way for Alice to complete a chargeback on the money that she sent to Bob. Although, Satoshi Nakamoto created the blockchain technology to facilitate decentralized currency, entrepreneurs are constantly innovating and creating new applications of the blockchain technology. A famous blockchain enthusiast, Vitalik Buterin, built a blockchain-based decentralized contracting platform called Ethereum in 2014. More recently, start-ups are using the blockchain technology to decentralize lending markets. For example, the German company eSports.com is accepting cryptocurrency investments to crowdfund the capital required to launch their business idea. Similar to the Internet decentralizing information, blockchain technology is decentralizing money, contracting, and capital. The past few years have witnessed an explosive growth of Google searches and social media posts about the blockchain technology and cryptocurrency. However, people aren’t only searching for these terms. Over 600 applications were filed in the U.S. for blockchain and cryptocurrency related patents during 2016 and the beginning of 2017. Mainstream interest in cryptocurrency began in 2014, when the price of the most famous cryptocurrency, Bitcoin, soared for the first time to over 1,000 USD per Bitcoin. The exponential growth garnered worldwide attention and became the main topic at FinTech and finance conferences. 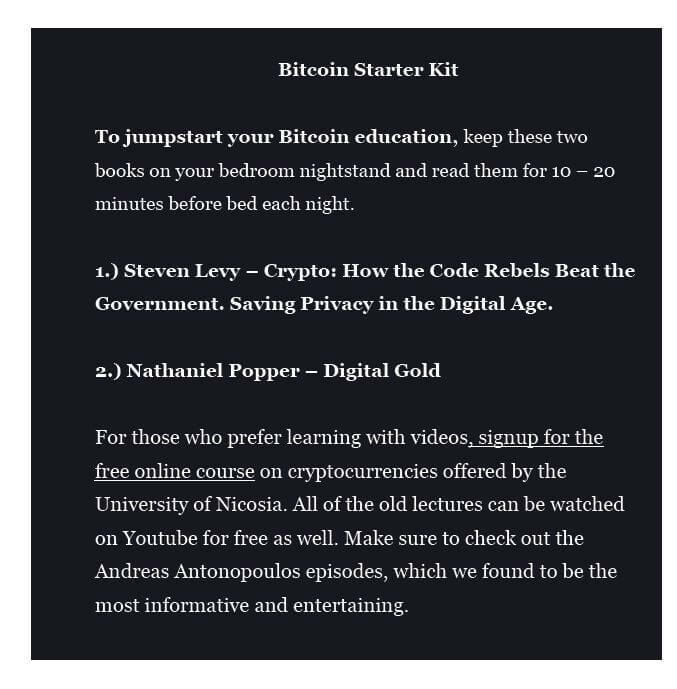 Following this rally, over 400 books on the topic of cryptocurrency were released on Amazon.com. Amazon responded by creating a new book subcategory, “Digital Currencies,” which feature several best sellers. The terms cryptocurrency and blockchain are used interchangeably due to the inability of separating these technologies. Bitcoin is the name of one cryptocurrency and blockchain. Ethereum is another. Ripple is another. There are over 1,000 different cryptocurrencies. Different cryptocurrency coins use different incentive structures to encourage computer nodes around the world to listen to new incoming transactions. The first successful implementation of a blockchain and cryptocurrency was Bitcoin. However, different strategies for verifying transactions within a decentralized network have given rise to different cryptocurrencies such as Litecoin, Nxt, Monero, and Bitcoin Cash. After attempts at making a private virtual currency had failed for 20 years, Bitcoin emerged amidst the 2008 global banking crisis. The creator of Bitcoin, unknown, was determined to create a decentralized, private, and secure way to transfer value online, which did not rely on trusting sovereign entities, central banks, or financial intermediaries. After being ridiculed as money for computer nerds and a conduit for illegal activity, investors are finally beginning to take notice of Bitcoin and the underlying technology, the blockchain. During November of 2017, the price a Bitcoin breached $11,000 per coin as shown in Figure 1. Bitcoin was the first and is still the most popular cryptocurrency and use of the blockchain technology. This system allows participants to send accounting units that store value, referred to as Bitcoin, from one user’s account to another user’s account without intermediaries. As a cryptocurrency, Bitcoin is a store of value and a medium of exchange combined in one. Bitcoin has a fixed supply capped at 21 million and the currency’s inflation rate is programmed to decrease by half about every four years. Daily, around 1,800 Bitcoin are released onto the market. This rate will half to 900 Bitcoin per day in 2020, and then to 450 Bitcoin per day in 2024. According to estimates, Bitcoin’s last coin will be mined in the year 2140 A.D. At the time of this report, approximately 16.5 million Bitcoin have been mined. The finite supply gradually enters the market according to a mathematical algorithm that releases approximately 12.5 Bitcoin into the network’s supply of Bitcoin every ten minutes. The inflation rate therefore decreases over time according to the algorithm until every unit of the finite supply has been released into the economy. 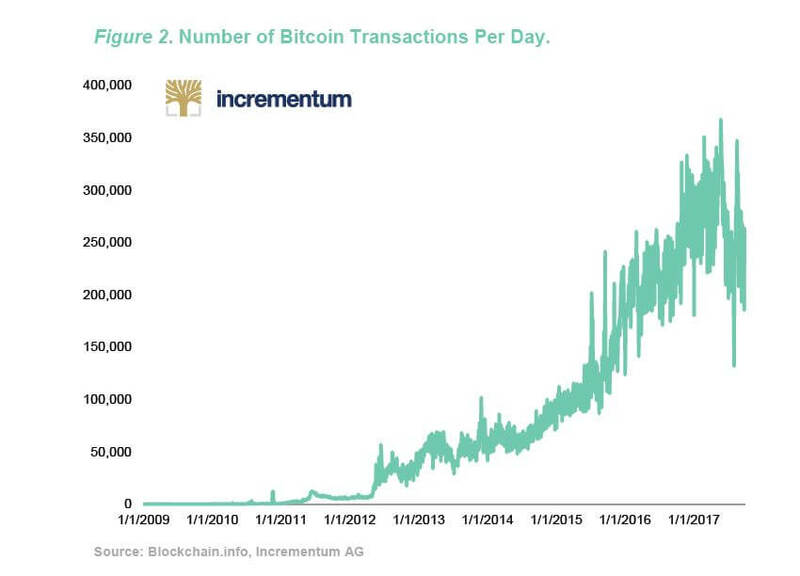 Since Bitcoin was launched in 2009, the transactions on the network have doubled every year. Figure 2 shows that that the Bitcoin network averages hundreds of thousands of transactions every day. The Bitcoin network is gaining in popularity as a payment system because transactions of any amount can be sent at anytime of the day to any place in the world. Although blockchain transactions do exist in physical servers, Bitcoin are not physical or even digital coins. Instead, a Bitcoin is a chain of electronic signatures that represents units on a digital ledger. 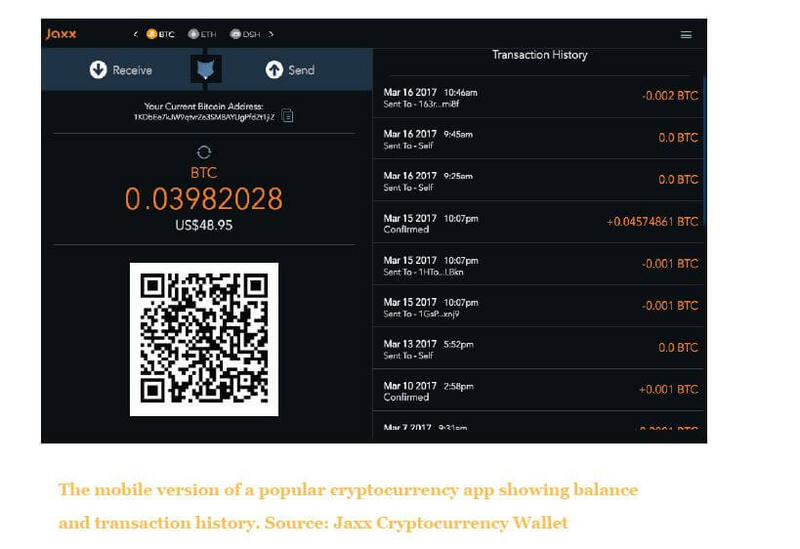 Network users can trade and store these fungible accounting units by debiting the account controlled by one participant and crediting the account held by another participant. An individual that creates a Bitcoin wallet can transfer accounting units to other users by digitally signing a private key on a transaction. The combination of several innovations from distributed computing and cryptography form the basis of the Bitcoin ecosystem, including the blockchain and the Bitcoin protocol. Satoshi Nakamoto’s invention was the first system, which effectively solved the “double-spending problem” and thereby enabled a safe peer-to-peer payment system. Double-spending is the digital version of counterfeiting fiat currency or debasing a physical commodity money, such as gold. In the aforementioned example, Alice could attempt to pay two people, Bob and Charlie using the same coin by duplicating the string of bits that represents the coin with serial number 1234567. Centralized payment systems, such as PayPal, solve the double-spend problem by using a centralized mechanism of validating real transactions. In computing terminology, a centralized solution to the double-spend problem is called an example of an SPOF because if PayPal’s server is jeopardized, the entire system fails. Instead, Bitcoin relies on the “proof-of-work” consensus mechanism to achieve decentralized consensus. Proof-of-work is an incentive structure in the Bitcoin software that rewards miners with transaction fees from users and with a pre-defined number of Bitcoin for successfully adding a block to the chain of previous transactions. The proof-of-work protocol timestamps the transactions recorded in the blockchain. The correct blockchain is always the blockchain with the longest history of proof-of-work computing. Using the simple rule to always mine on the longest blockchain ensures that miners all add transactions to the list of transactions that has received the highest amount of computing resources. Network agreement on the state of transactions eliminates the potential to double-spend the same coin without the presence of a central clearinghouse. The 2017 In Gold We Trust report provides a thorough introduction to the topic of Bitcoin and gold in the chapter, In Bitcoin We Trust? Due to the positive feedback and curiosity that the chapter piqued, a more in-depth analysis of these two assets is elaborated on in this section. Originally, Bitcoin and the underlying blockchain technology were designed to replicate the characteristics of gold, which make it uniquely suited to be money. However, Bitcoin constitutes an unparalleled asset class and can be a fundamental part of wealth management from the portfolio diversification perspective. For the past eight years, Bitcoin’s daily returns have had a low to slightly negative correlation with gold. The main reason is that Bitcoin and gold have different use cases and different risks. However, from a portfolio construction point of view, one must be aware of the extremely high volatility, which this asset class exposes. Bitcoin is entirely digital, and therefore, does not exist in a physical form like gold. Also, in contrast with gold, Bitcoin does not have industrial applications. Instead, demand for Bitcoin comes from people around the world who demand a fast, private, and appreciating asset. Like gold, Bitcoin is scarce. Throughout history, 5.6 billion ounces of gold have been mined. In comparison, 16.5 million Bitcoin have already been mined, and the inventor capped the total amount of Bitcoin at 21 million. Also, similar to gold, Bitcoin is a store of value and a medium of exchange combined in one. However, the cryptographic and digital nature of Bitcoin makes it inherently both easier to transfer and harder to find than gold. 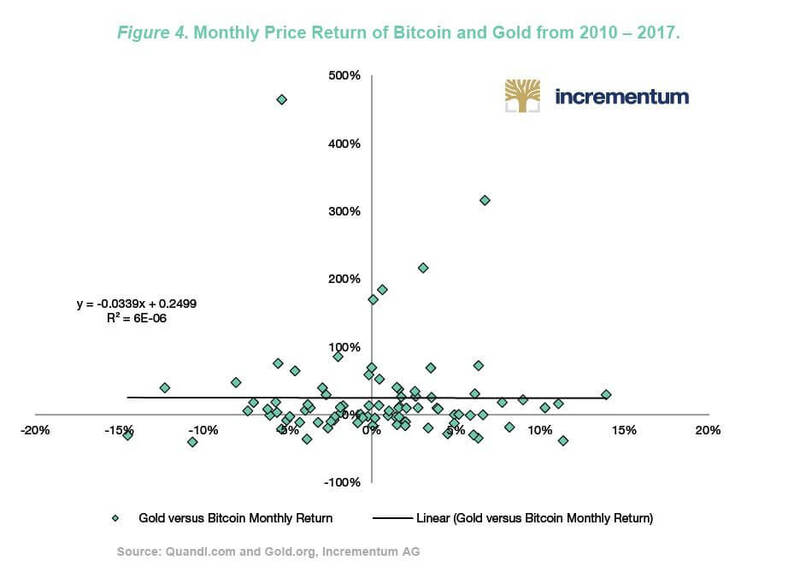 The scatterplot in Figure 4 shows the monthly returns of gold plotted against the monthly returns of Bitcoin. 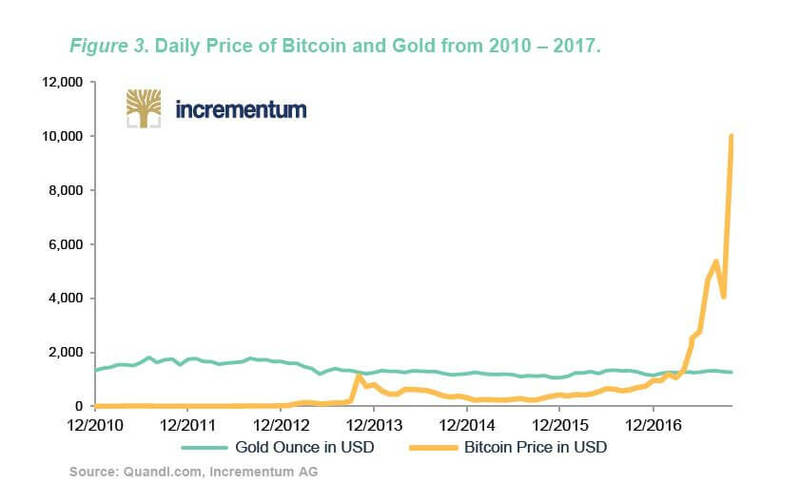 The y-axis represents Bitcoin and the horizontal axis gold. During the past eight years, Bitcoin’s monthly return ranged from positive 465% in November of 2013 to negative 40% in September 2011. During the same time, gold’s volatility was much lower. Gold’s largest decrease in return of 14.5% occurred in June of 2013, while gold’s largest increase of 13.9% occurred in January of 2012. The black trend line shows that the historical monthly returns for Bitcoin and gold are primarily uncorrelated. However, Bitcoin does not win a unanimous vote compared to gold. Unlike gold, the risks associated with Bitcoin are uncertain. Gold’s track record is 5,000 years, while Bitcoin’s is only a couple of years. The value of the Bitcoin network relies on the Internet and the geographic dispersion of computers around the world that maintain the network and history of transactions. Loss of the Internet would cripple the Bitcoin blockchain. Due to the different risk and return profiles, Bitcoin and gold constitute two distinct asset classes. A growing body of academic research increasingly suggests that a diversified portfolio should only be 1 to 2% in Bitcoin. Bitcoin’s novel combination of distributed computing, encryption, and open-source programming inspired the creation of over 1,000 cryptocurrencies. In 2011, Bitcoin was the only currency and therefore held 100% of the cryptocurrency market’s capitalization. Today, Bitcoin’s share of the cryptocurrency market has fallen to less than half. 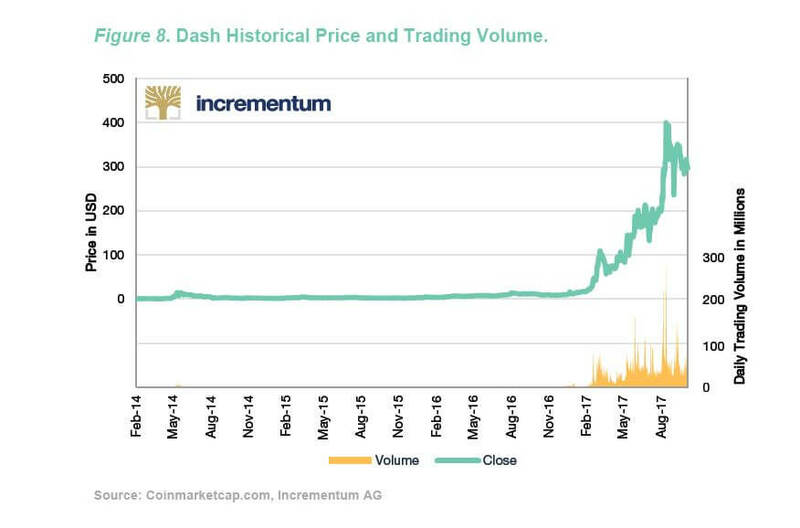 In addition to Bitcoin, cryptocurrencies such as Litecoin, Dash, Ethereum, and Bitcoin Cash are attracting traditional investors to this new digital asset class. Upon closer inspection, each of the top ten cryptocurrencies attempts to solve a different problem. 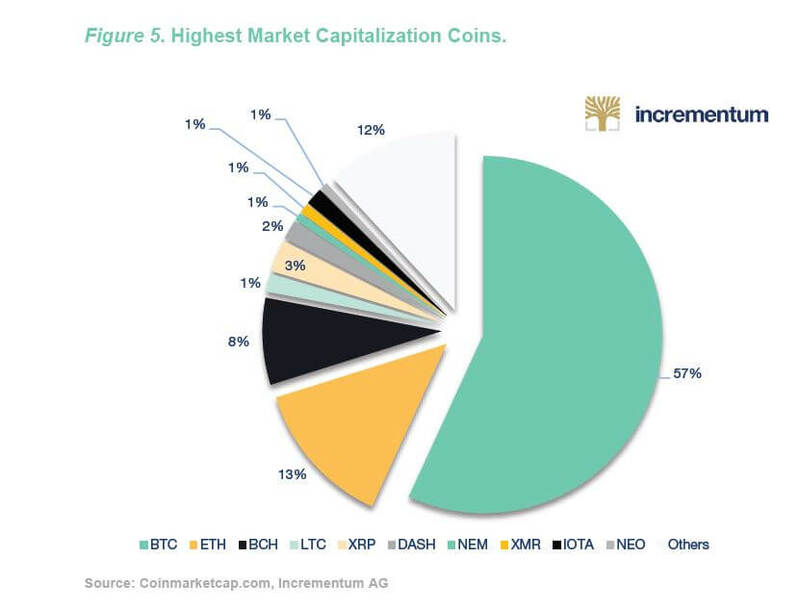 Incrementum has created a cryptocurrency classification system to enhance investor proficiency of this asset class. For example, Bitcoin, Litecoin, Dash, and Bitcoin Cash are part of the money subclass because these digital tokens compete with fiat currencies such as the U.S. dollar, euro, and renminbi. This subclass offers fast, private, and “permissionless” payments. Each of the money cryptocurrencies has a unique monetary policy. For example, the total supply of Litecoin is four times the total supply of Bitcoin. Also, Dash offers more privacy compared to Bitcoin or Bitecoin. Bitcoin cash focuses on increasing the number of transactions that can be processed per second. In contrast, cryptocurrencies such as Ethereum, Lisk, and IOTA are infrastructure coins. Instead of competing with fiat money, the subclass of infrastructure tokens enables decentralized contracting. For example, marriage contracts, cosmetology licenses, and seal of approval certificates can be issued and publicly stored on the Ethereum network. The final subclass of cryptocurrencies includes all of the remaining cryptocurrencies. These coins solve unique problems that are not related to money or infrastructure. For example, Augur is a decentralized prediction market that is built on the Ethereum infrastructure. Another coin, TenX, is a credit card that allows users to spend cryptocurrencies where credit cards are accepted. These three subclasses; money, infrastructure, and general purpose, make up the super class of cryptocurrency assets. In the same way that stocks are highly correlated with other stocks, the subclasses of cryptocurrencies are also highly correlated. However, the correlations between cryptocurrencies provide evidence for the cryptocurrency classification. Each cryptocurrency has different applications and different risks, which should be considered when making investment decisions. The table below shows the correlation of the excess daily logarithmic returns between Bitcoin, Litecoin, Dash, and Ethereum. As the cross-correlation matrix shows, Bitcoin’s excess daily logarithmic return correlation with other cryptocurrencies from the money subclass is higher than with Ethereum, which is a cryptocurrency in the infrastructure subclass. This indicates that Bitcoin is competing more with Litecoin and Dash compared to Ethereum. As shown in row 2 and column 1 of the matrix, Bitcoin’s return correlation value of 0.56 with Litecoin means that Bitcoin is more correlated with Litecoin than with Dash or Ethereum. Overall, all of the cryptocurrencies are correlated positively; however, there is statistical support for a classification system based on the application of each cryptocurrency. 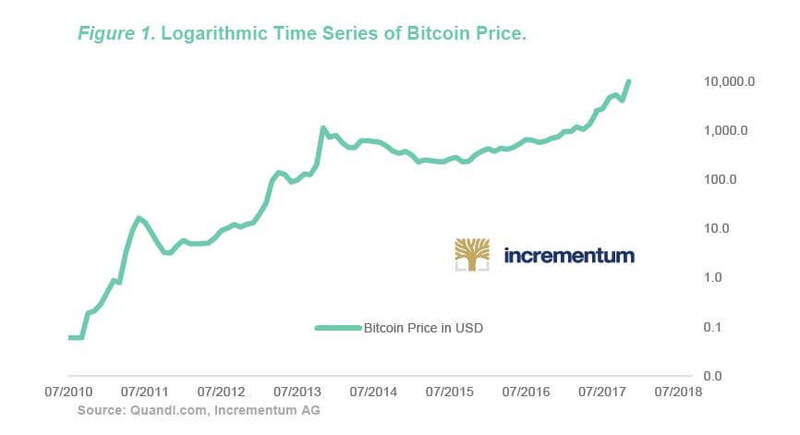 Incrementum focuses on the subclass of money and infrastructure cryptocurrencies. From the money subclass, the highest market capitalization coins include Bitcoin, Litecoin, Dash, and Bitcoin Cash. From the infrastructure class, Ethereum is leading the way. To provide a better understanding, a summary for each of the four alternative cryptocurrencies is available below. Similar to Bitcoin, Bitcoin Cash is a cryptocurrency from the money subclass. Bitcoin Cash was created on August 1, 2017 during a hard-fork of the original Bitcoin cryptocurrency. 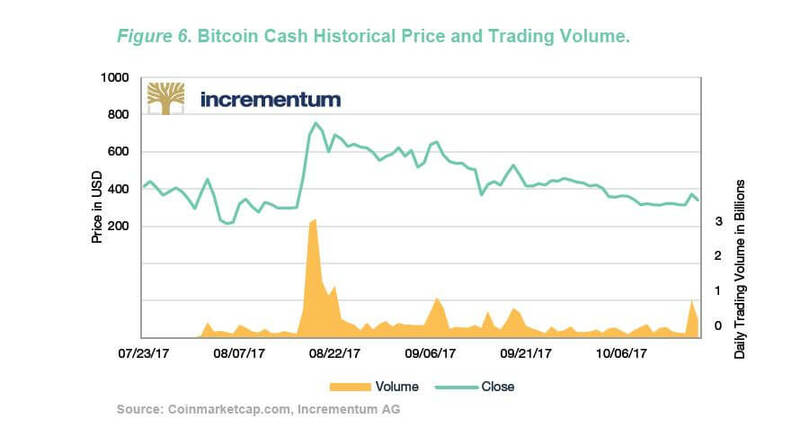 With a value of approximately $1,400 per coin and 16.5 mi llion coins in circulations, Bitcoin Cash has a market capitalization of $23 billion. Litecoin was announced as an alternative to Bitcoin in 2011. In the cryptocurrency market, Litecoin is often referred to as “silver” and Bitcoin is referred to as “gold.” Litecoin is considered to be silver because the Litecoin network can process transactions four times faster than the Bitcoin network. Also, the total supply of Litecoin is 84 million while Bitcoin’s supply is capped at 21 million. 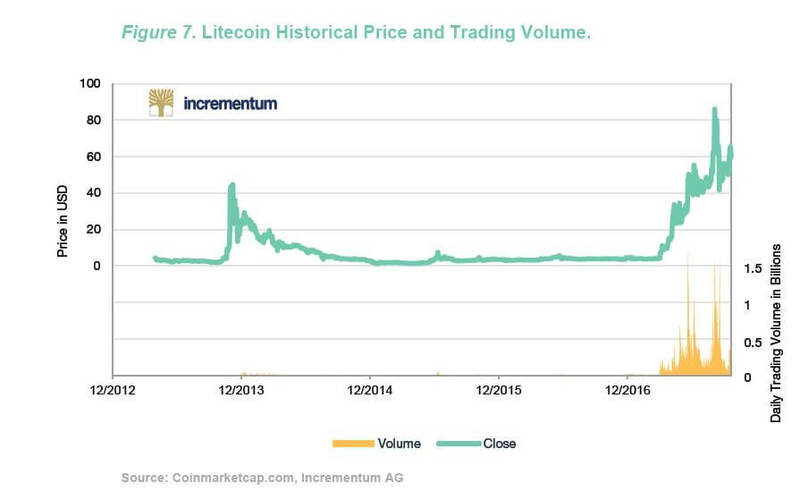 This four-fold increase in cryptocurrency units means that the inflation rate of Litecoin is higher than Bitcoin. Invented after Bitcoin and Litecoin, Dash focuses on privacy and pseudonymity. Prior to being rebranded as Dash, this cryptocurrency went by the name Darkcoin. Dash developed new methods for reducing the traceability of transactions by mixing many transactions together before sending them to the final destination. The process of mixing blurs the identity of the original sender. To increase privacy further, Dash does not have a publicly available ledger. Recently, the developers of Dash have made successful efforts to increase merchant acceptance. Unlike Bitcoin Cash, Litecoin, and Dash, Ethereum is an infrastructure cryptocurrency that enables “smart” contracts – digital contracts that automatically execute preprogrammed agreements. Similar to the Bitcoin network, the thousands of Ethereum nodes around the world maintain the Ethereum network. The Ethereum infrastructure provides a platform where decentralized applications can be built and operated by anyone. Ethereum smart contracts operate without downtime or censorship. Smart contracts work with the Ethereum network’s native cryptocurrency referred to as ether. With approximately 94 million ethers and a price of $460 per token, Ethereum’s market capitalization is approximately $44 billion. Currently, there are over 1,000 actively listed cryptocurrencies, and every week a few more cryptocurrencies are released to the market. When a group of developers is ready to launch their new cryptocurrency, they can have an “initial coin offering” (ICO) or “token generating event (TGE)”. 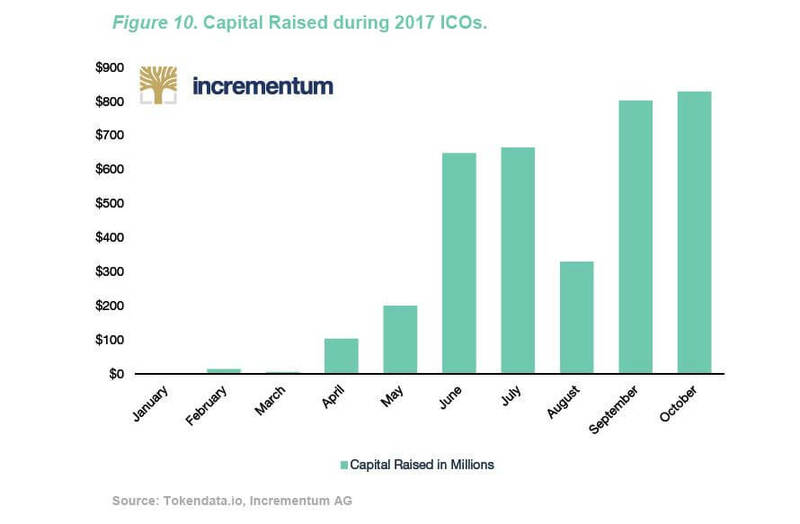 In 2017, ICOs raised over $1.7 billion in investment capital. For example, the French developers behind the cryptocurrency Tezos raised $232 million in July of 2017. The month prior, Bancor raised $150 million. In fact, out of the 25 highest crowd-funded projects in all of history, 18 of them are blockchain companies. The term ICO is based on the term IPO, which stands for initial public offering. However, initial public offerings are fundamentally different from initial coin offerings. Therefore, what is called an ICO in the cryptocurrency world is not exactly a parallel concept to an IPO. An ICO is more of a crowdfund whereas the first day the token is launched on an exchange is the IPO because you cannot easily trade your tokens during an ICO. Instead, investors have to wait until the token is launched on an exchange. Therefore, the more fitting equivalent of a stock IPO is the first day a token is launched on an exchange. However, the comparison does not fit exactly because firms that go to IPO usually have a history and a track record for investors to research. In contrast, many of the firms going to ICO now do not have a history. According to the PWC report, Considering an IPO (2012) firms have to pay $3.7 million to go to IPO. In contrast, ICOs can cost close to nothing to conduct. Instead, the development team that performs the ICO often has “no skin in the game”. Developers and entrepreneurs, who are sometimes not even incorporated in any geographic location, can launch an ICO without involving an underwriter, receiving the appropriate green lights from regulators, or paying the costs associated with the traditional framework. Due to no barriers to entry for investors or for firms, ICOs should not have the systematic underpricing pattern that stock J. Ritter reported on IPOs in 1991. Underpricing refers to the fact that the price of a firm’s stock share is signifi cantly lower during the initial public offering compared to the closing price of the share on the first day of secondary market trading. Using data on the past 50 years, Professor Ritter has found that stock IPO prices have been 16.8% lower during the IPO on the primary market compared to the price on the secondary market at the 3-year anniversary of the IPO. This equates to approximately $125 billion being earned by IPO investors instead of going to the firms. Several explanations have been given for the cause of the underpricing. A major cause has been attributed to the conflict of interest between the investment banks that underwrite the IPO and the firm going to IPO. By artificially decreasing demand with eligibility requirements that limit investment, investment banks can secure low prices for themselves and their clients. When secondary markets open, investments banks and their clients are often able to realize instant gains because of the systematic underpricing. The only coins that have at least three years of data provide empirical evidence that ICOs have systematic overpricing. Overpricing refers to a higher closing price on the first day the token is traded on an exchange compared to the closing price on the three-year trading anniversary of the token. Figure 11 shows that only 5 out of the 21 ICOs in 2013 and 2014 had a positive return on the first day of trading on an exchange. These five coins were Mastercoin, Bitshares, Counterparty, Maidsafe, and Qora. The main takeaway is that most cryptocurrencies are immediately dumped on the market the moment the coins are traded on an exchange. Even the second largest market capitalization coin, Ethereum, lost 73% in value the day it was launched on an exchange. Currently, little research has been done on the cause of this phenomenon. Figure 12 shows that the exchange adoption returns do not improve by the third-year anniversary of the coin. Only 5 out of 20 had a positive return between their opening price on the day of exchange adoption and the closing price on their third-year anniversary of being traded. The five coins were Mastercoin (165%), Bitshares (984%), Maidsafe (3,262%), Storj-x (10,061%), and Nubits (2%). However, the limited amount of data available on 2013 and 2014 means that inferences made are not statistically significant. 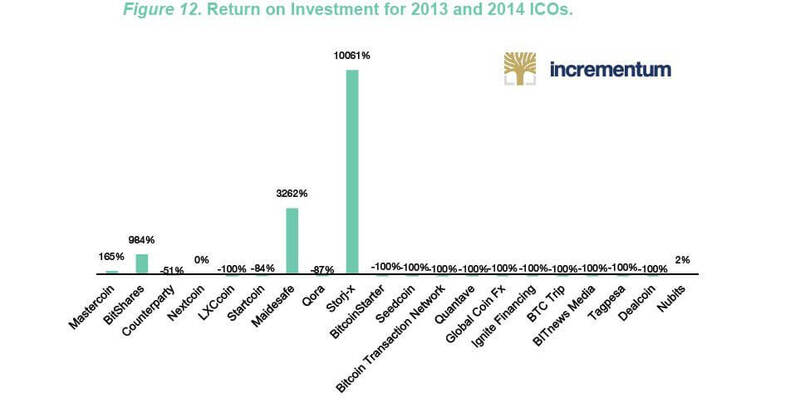 The cryptocurrencies that went to ICO in 2013 and 2014 may not representative of the entire population of cryptocurrency ICOs. Since less than 30 coins went to ICO in total, the central limit theorem does not apply. As more data becomes available, further analysis should be applied to check the sign of the average return on ICOs and ICO three-year anniversaries. As a final caveat, the cryptocurrency market has changed rapidly since these coins went to ICO. If a price pattern does exist and investors determine the pattern, then the pattern will change. For example, if the price always increases after the ICO then investors will try to invest during the ICO phase. If a large number of investors invest during the ICO phase in anticipation of post-ICO gains, then the ICO price may become overvalued. 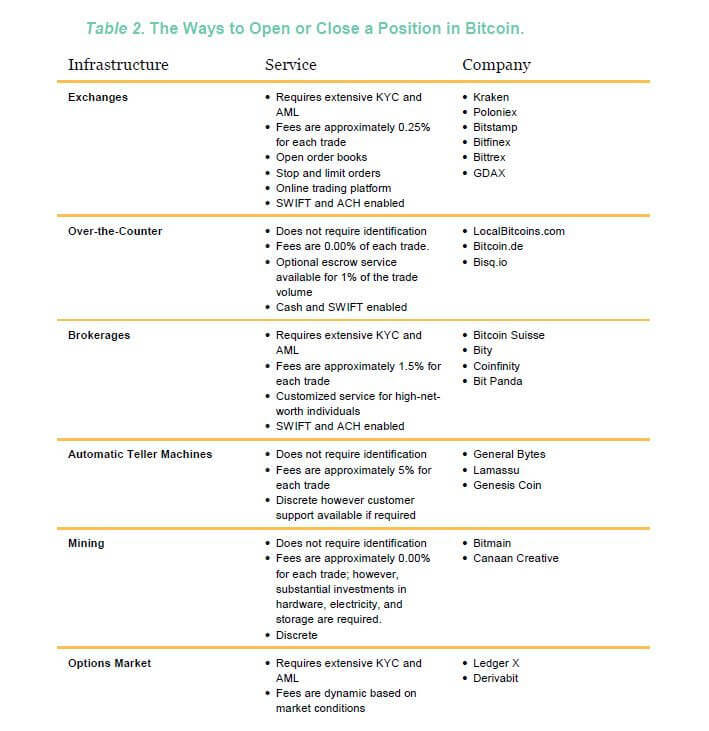 As shown in Table 1, financial infrastructure is maturing in the cryptocurrency market. Private banks are beginning to offer customers cryptocurrency bank accounts. Start-up companies, such as the Tenx in Singapore, are issuing credit cards that can be filled with cryptocurrencies. Companies such as Bitcoin Suisse in Switzerland are operating cryptocurrency automatic teller machines (ATMs) that dispense Bitcoin for Swiss francs and accept Swiss francs for Bitcoin. Cryptocurrency exchanges, such as Bitfinex and Poloniex are paying interest on “cryptocurrency deposits.” Wallstreet “quants” are building algorithms for trading bots that take advantage of arbitrage opportunities on different exchanges. Large players are negotiating special pricing with cryptocurrency exchanges and miners. The cryptocurrency market even has an equivalent of the traditional underwriter. Cryptocurrency brokers and law firms offer underwriting for initial coin offerings and charge a percent of the capital raised during the ICO. Finally, legal licenses are being granted to a handful of firms that satisfy regulatory requirements. This section outlines the basics of cryptocurrency exchanges, over-the-counter markets, and brokerages. A cryptocurrency exchange is a website where investors can buy and sell cryptocurrencies for other cryptocurrencies or for fiat money such as USD and EUR. Cryptocurrency exchanges are generating the highest revenues during the cryptocurrency boom. Coinbase, the biggest exchange in the U.S., has a valuation of over $1 billion. Gemini is an exchange made by the Winklevoss Twins, who sued Mark Zuckerberg over the ownership of Facebook. However, Gemini is only open to U.S. based cryptocurrency traders. The six most important exchanges on an international basis include Kraken, Poloniex, Bitstamp, Bitfinex, and Bittrex, and GDAX owned by Coinbase. Kraken is a cryptocurrency exchange that has its headquartered in San Francisco, California. The exchange has been in business for six years, and has the largest daily trading volume for the Bitcoin/euro pair. The exchange offers trading in several fiat currencies including USD and EUR and several cryptocurrencies including BTC, ETH, ETC, DASH, GNO, ICN, Litecoin, MLN, Monero, REP, Ripple, Zcash, and Stellar. Kraken has fees ranging from 0.05 – 0.50% per trade depending on the trader’s volume and the cryptocurrency they are trading. Unlike Kraken, Bitstamp, and Bitfinex, Poloniex is a cryptocurrency exchange that does not allow fiat deposits and withdraws. Therefore, customers must purchase cryptocurrencies from other sellers and then deposit cryptocurrencies on the exchange before they can begin trading. Poloniex has fees ranging from 0.00% – 0.25% per trade depending on the trader’s volume and the cryptocurrency they are trading. Bitstamp is a cryptocurrency exchange headquartered in Luxembourg. The exchange has been in business since 2011. The exchange offers trading in several fiat currencies including USD and EUR and several cryptocurrencies including BTC, ETH, LTC , and Ripple. In 2015, Bitstamp was hacked for approximately 19,000 Bitcoin, and the exchange shutdown services for one week. Bitfinex is a cryptocurrency exchange headquartered in Hong Kong. The exchange has been in business since 2012, and the exchange has the largest daily trading volume for the Bitcoin/USD pair. The exchange offers trading in USD and several cryptocurrencies including BTC, ETH, ETC, DASH, Litecoin, Monero, IOT, Ripple, and NEO. In 2016, Bitfinex was hacked and a value of $72 million was stolen. By April of 2017, all customers had been paid back for the hack. Bitfinex is a cryptocurrency exchange headquartered in the USA. Bittrex was founded in 2014. Like Poloniex, Bittrex is a cryptocurrency exchange that does not allow fiat deposits and withdraws. Therefore, customers must purchase cryptocurrencies from other sellers and then deposit cryptocurrencies on the exchange before they can begin trading. Bittrex has a fee of 0.25% per trade regardless of the coin or the volume being traded. The Global Digital Asset Exchange (GDAX) is owned by Coinbase, which is registered in San Francisco, California. Coinbase has been in operation since 2012, has over 7 million registered users, and operates in 32 different countries. Coinbase is one of only three firms that has received the New York BitLicense, which entitles them to provide services to New York persons. GDAX offers BTC, ETH, and LTC. GDAX is a cryptocurrency exchange that allows USD, EUR, and GDP deposits and withdraws. GDAX has fees ranging from 0.1% – 0.25% per trade depending on the trader’s volume and the cryptocurrency they are trading. Over the counter (OTC) markets in the cryptocurrency sphere refer to websites that allow buyers and sellers to make customized contracts with one another. A major reason for the popularity of OTC markets for cryptocurrencies is that personal identification is often not required. The most famous OTC markets include LocalBitcoins.com based in Finland and Bitcoin.de based in Germany. Many transactions on OTC markets include no fees. However, OTC markets also offer optional escrow services that customers can elect to pay for. For example, LocalBitcoins.com charges 1% of the amount in escrow. In addition to cryptocurrency exchanges and 0ver-the-counter markets, the cryptocurrency ecosystem has the equivalent of traditional investment banks like Goldman Sachs. In the crypto world, brokerages are the new investment banks. They help new cryptocurrency companies launch initial coin offerings by setting up escrow accounts, clearing qualified investors, and settling trades. Brokerages charge a percentage of total revenue earned by the ICO. Brokerages also offer customized service for high-net-wealth individuals who want to gain exposure to cryptocurrencies. This service is paid for by the spread between the price that the brokerage buys or sells the cryptocurrency at on an exchange, and the price they charge the customer. The largest brokerage in Europe, Bitcoin Suisse in Zug, Switzerland has a monthly turnover of $150 million. Other brokerages include Coinfinity in Graz and BitPanda in Vienna. In conclusion, cryptocurrencies and the blockchain technology are becoming everyday words. The cryptocurrency market has grown from a market capitalization of $0.00 in 2010 to over $430 billion in 2017. The absolute return of over one million percent has driven interest in this technology. The interest has attracted great minds and investors into the space. Today, the market is maturing into an efficient market with updated versions of traditional financial intermediaries. Exchanges, brokerages, derivatives, and credit cards are developing for the cryptocurrency market. However, the impact that these technologies will have on the world is still unknown. The open-source nature of public blockchain software allows anyone to use Nakamoto’s inventions for the development of new technologies. At the same time, if governments decide that permissionless blockchains are too revolutionary, governments may try to limit further innovation. At each step of development in the cryptocurrency market, the Crypto Research Report hopes to be your go-to-guide for critical analysis. 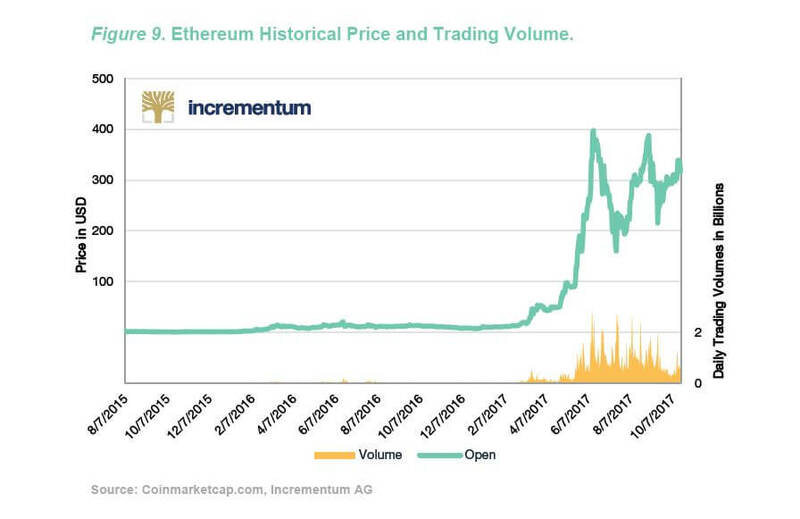 The constantly evolving cryptocurrency space needs a reliable source for up-to-date information, and Incrementum has accepted the challenge. We wish you an informative and educational read through our inaugural report. The rest of this edition includes exclusive interviews, statistical analyses of different cryptocurrencies, and helpful insights on frequently asked questions. Also, we invite you to look for each subsequent edition of The Crypto Research Report. Over time, the CRR aims to become a leading authority on cryptocurrency and blockchain investments for financial market participants and institutions. We look forward to understanding the investment potential of these exciting new technologies together! We welcome your feedback: crypto@incrementum.li. Unlike normal databases, public blockchains are not owned by a central entity. This is a simplification of the double-spend problem in cryptography. As previously mentioned, each Bitcoin does not have a unique serial number. A fork in the blockchain occurs if the protocol is been upgraded, but not all users agree on the changes. The existing chain of transactions is split into two paths. One path which follows the new, upgraded blockchain, and one path which continues along the old path. ICO and TGE have the same meaning. In order to make ICOs look less like IPOs, some law firms, such as MME in Zug, recommend for developers to avoid traditional finance terms that may signal to authorities that cryptocurrencies are securities. Some developers do not do an ICO. Instead, they rely on Airdrops, Hardforks, or Initial Minings. Ritter, J. R. (1991). The long-run performance of initial public offerings. The Journal of Finance, 46(1), 3–27. Ethereum had to be dropped from the analysis because only two years of trading data are available.